WPlace ERP is an all-in-one open source business management software and is a perfect fit for both small and large companies a like. It is a business suite containing a number of applications, each tailored for a specific department like sales, project management, inventory and warehouse management, manufacturing, human resource management, and others. Wplace ERP is a complete suite of business applications that can address all the business needs of your company. Affordable. The lack of license fees makes A complete set of online and on-site services is offered. Modular. WPlace ERP modular approach allows you to start with one application, and then add more to suit your needs. So you keep the advantage of integrated software while avoiding a big bang in your company. 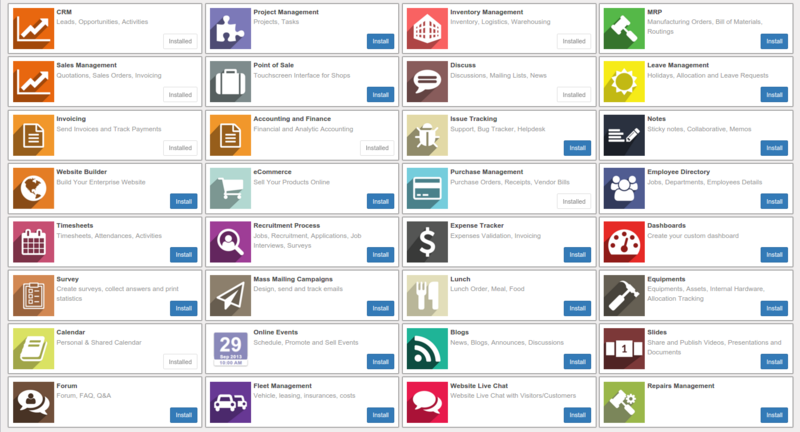 WPlace ERP allows you to customize the user interface, search fields and your reports in a few clicks. The software can be deployed on any computer or via the web. All you need is a web browser. Sales (CRM, Sales, Invoicing, Sign, Subscriptions). Operations (Accounting, Project, Timesheets, Helpdesk, Inventory, Purchase, Documents). Manufacturing (Manufacturing, PLM, Maintenance, Quality, Repair). Marketing (Mass Mailing, Automation, Events, Survey, Appointments, Mailing Lists). Human Resources (Employees, Recruitment, Leaves, Expenses, Appraisal, Fleet). Website (Website, eCommerce, Blog, Forum, Slides, Live Chat).